For many years MHA had acknowledged that it needed to also focus on disadvantaged residents of the Metro, the aged in particular, bearing in mind that MHA’s residential and caring facilities essentially cater for those folk whose financial position allows them to live in comfortable, affordable, safe and secure accommodation. In May 2005 MHA’s Nikithemba outreach project was officially presented to the Gqebera (Walmer Township) community at a service at the John Masiza Society’s church. The project is called “Nikithemba”, which in the Xhosa language means “To give hope”. 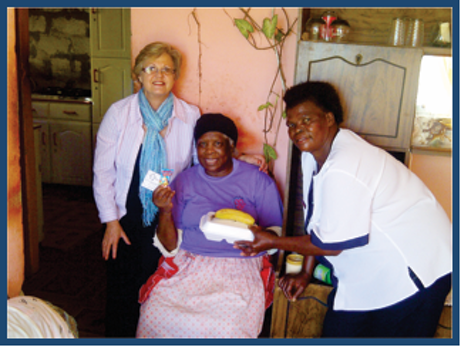 It was agreed that MHA would provide a nourishing daily meal for housebound indigent people, who were initially selected on a “needs” basis from the John Masiza Society membership. A group of 60 elderly was identified, and 30 meals per day were to be provided on a roster basis. The meals are taken to the beneficiaries by a team of basically trained carers, drawn from the Gqebera community. In addition to delivering the meals, the carers also attend to basic hygiene needs, and provide companionship and some spiritual upliftment. Since its mid-2005 launch, MHA has committed over R1 000 000 to Nikithemba.